After a long construction period all team members of the cloud.operations team moved into their new workplace on 01.07.2018. The modern design of the previously unused part of the factory building offers a lot of space for the continuously growing team. Athletic balance is important. blue technologies successfully participated in the 9th AOK company run for the district of Warendorf on 27.04.2018 in Oelde. Congratulations! also sets focus on regional business and took part in a competition and the exclusive award ceremony „Attractive Employer in district Warendorf“ on November 10, 2016 in Oelde. Coordinated by the GFW, more than 40 companies competed in 6 categories to claim the coveted title „Attractive Employer“. ranks among the top IT Growth Champions in Germany. This is the result of a study conducted by the news magazine FOCUS in cooperation with the data company statista. “The fact that blue technologies is listed as the 19th fastest growing IT company in Germany is an impressive team achievement and reflects the solid work of the whole company”, reflects Dirk Webbeler (CEO). The top list of Growth Champions ranks companies that reported an extraordinarily high percentage revenue growth between 2012 and 2015. Independent publicly traded companies as well as private firms were analyzed. Over all 500, blue technologies achieved rank 209. Ranked 24 of 50 is an excellent result for blue technologies which makes me more than proud”, says Dirk Webbeler (CEO). „A growth rate of 212 % over the last four years speaks for itself”. 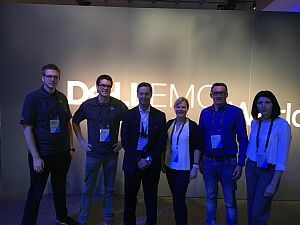 6 of 15 blue technologies team members received state-of-the-art information about technology and future business segments at Dell EMC World in Austin/Texas from 18 to 20 October 2016. Newest trends and technologies combined with a wide range of information about the merger of Dell and EMC formed an excellent and profound knowledge pool for future-oriented work. 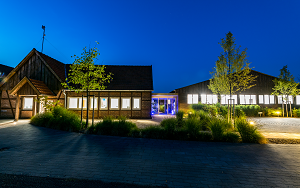 Learn more about design and acoustic terms of blue technologies new executive briefing center in „Zeitgeist“, a magazine published by Bruag AG, Switzerland. Listen to radio WAF; February 4, 2016. Great customer contact and outstanding reliability belong to the most important components of individual IT-Consulting. „We always seek to develop a close partnership in order to respond faster and more directly to our customer needs“, summarizes Dirk Webbeler (CEO). „Apart from developing customer projects we set focus on our permanent technical ongoing support”, adds Till Feldermann (team leader consulting). In order to achieve long-lasting customer relationships with extreme high demands on quality and planning reliability, blue technologies opened a second office in Paderborn on February 1, 2016. “We began our IT consultancy business ten years ago this May with intelligent IT solutions in server and storage infrastructure as well as long-term network technology and security solutions. Our team has been growing significantly, we’ve become a Dell Premier Partner, and in addition to small and medium-sized businesses we increasingly have large companies joining our ever expanding customer base,” says Dirk Webbeler, founder and owner of Blue Technologies. 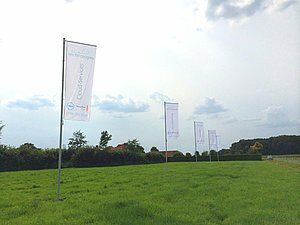 “Our clients see us a reliable and extremely flexible IT partner who continually adapts to the market and stands out for having great expertise!” In its anniversary year blue technologies bluetechnologies is opening a modern employee centre and Executive Briefing Centre right next to its current premises in Everswinkel. bluetechnologies is expanding and turning the old carpentry workshop that used to belong to its founder's grandfather into a modern employee centre and Executive Briefing Centre that is due to open in 2015. Photographs showing the build’s latest progress can be found here. Our customers have been benefiting from the highest Dell partner status since August 2014, as bluetechnologies is now an official Dell PartnerDirect Premier Partner. 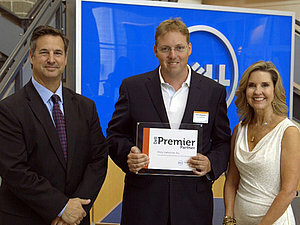 Dirk Webbeler (CEO of Blue Technologies Ltd. & Co. KG) was presented with the new DELL Premier Partner status on 31/7/2014 in Round Rock (Texas) by Cheryl Cook (Vice President of Global Channels and Alliances) and Marius Haas (President Enterprise Solutions Group, Chief Commercial Officer, left). We are proud of our new CI and website, both launched at the end of 2014.